It’s been over ten years since Karl Hector and the Malcouns’ Sahara Swing saw release on Now-Again in 2008. The album swung with influences from across the African diaspora and set the stage for a cult, but influential following. 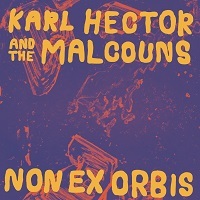 Hermes designer Christophe Lemaire picked tracks from Karl Hector and The Malcouns as amongst his favorites in the Now-Again catalog, and included them on his Where Are You From anthology. Festival promoters intrigued by the possibility of resurrecting the careers of once forgotten African mavericks – from Ghana’s Ebo Taylor to the progenitors of Zambia’s Zamrock scene – brought Hector and crew across Europe playing festivals for ecstatic fans. Producer JJ Whitefield even founded an Afro-Rock band, Johnny!, with Taylor’s son Henry. Unstraight Ahead, their sophomore release from 2014, found the band exploring territories even outside of the expansive scope of Sahara Swing: West African sounds of Ghana and Mali met the East African sounds of Mulatu Astatke’s Ethiopian jazz, tied together with the groove heavy experimentalism of The Malcouns’ 70s Krautrock godfathers: Can, of course, but also more obscure and equally adventurous groups like Agitation Free, Ibliss and Tomorrow’s Gift. Non Ex Orbis, the band’s third studio album, digs deeper into the Krautrock history embedded deep in the soil of their native Munch – three of the most influential bands of the 1970s experimental German rock scene sprung from there: Amon Düül, Popol Vuh and Embryo. Influenced by these musical heroes, Whitefield shapes a sound that takes the experimental approach of the classic Krautrock era and slides between beat-heavy drone and spacey, prog-rock suites. Marja Burchard, daughter of Embryo mastermind Christian Burchard, fronts the group on keyboard, vibraphone and other-worldly vocals. Al Markovic joins longstanding Malcoun Zdenko Curilija to round out the ensemble.